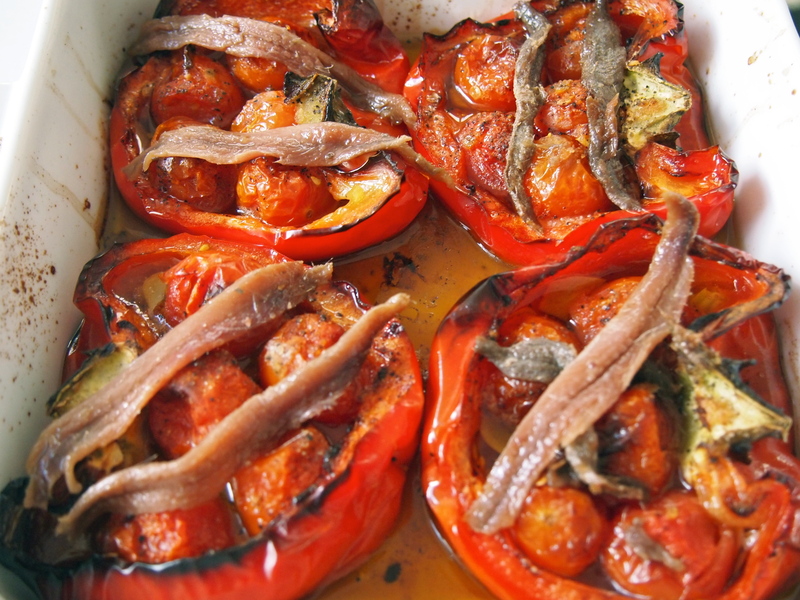 A while ago I made a batch of Simon Hopkinson’s Piedmontese baked red peppers as a side dish to a steak meal. There was some leftover so during the week I chopped up the remaining peppers along with all the garlic and tomato infused oil they were steeped in and added them to spaghetti, creating one of the best pasta dishes we’ve had in a long time. 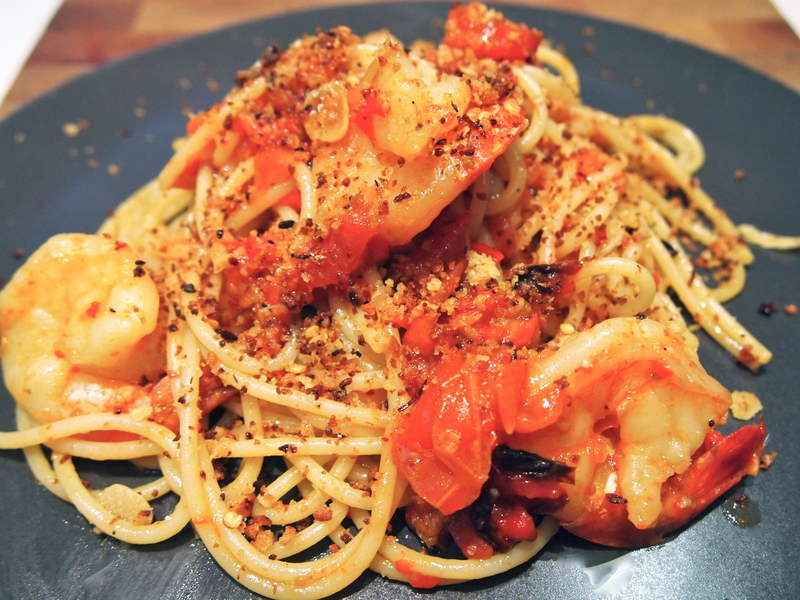 In fact it was so good that I now cook Simon Hopkinson’s peppers just to make this pasta dish. 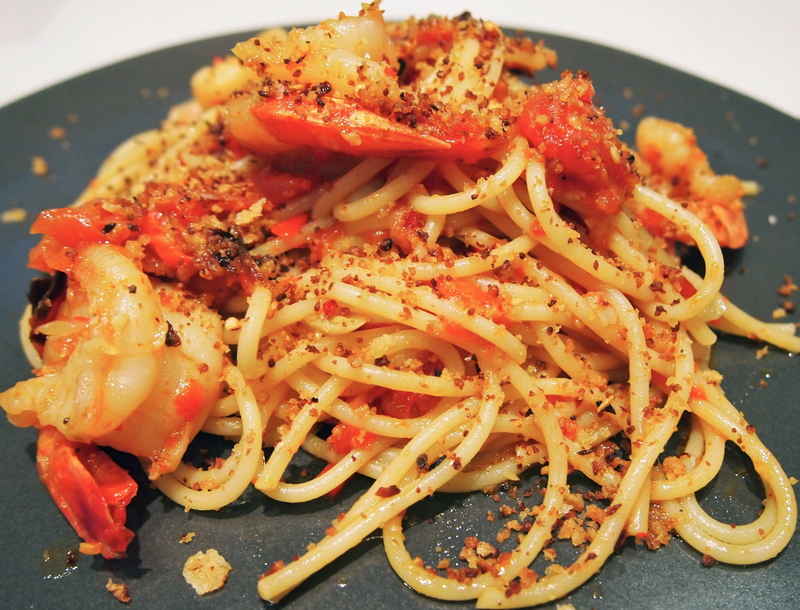 In this version I’ve added some prawns and a delicious pangrattato which is an Italian toasted bread crumb mixture that’s popular in Sicily, where it’s sometimes used as a topping instead of parmesan cheese. The pangrattato was spiked with lots of garlic, dried chilli and porcini and added a delicious crunchy flavour boost to every forkful. This is pasta in the true Italian sense in that there’s just enough sauce to cling to the spaghetti, it’s not a saucy ragu. I also highly recommend undercooking the spaghetti more than you’re normally used to as it somehow makes the dish taste even better. I like to cook the pasta slightly hard or “duro” as the Italians would say, even more so than the usual al dente. Try it and you’ll never over cook your pasta again. To make the pangrattato place all the ingredients except the oil into a food processor and briefly pulse until the bread is roughly chopped into crumbs. 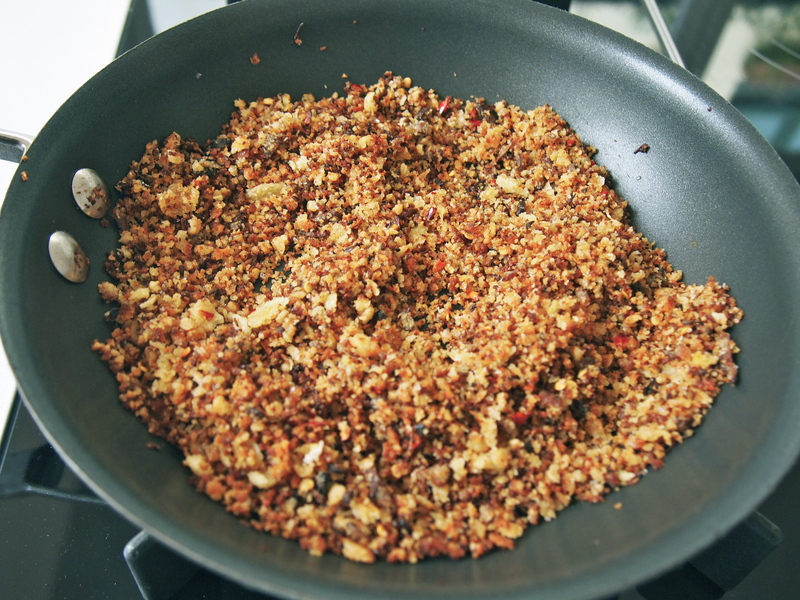 Heat a generous amount of oil in a small non stick fry pan and when hot add the breadcrumb mixture. Season with salt and cook, stirring regularly until the crumbs are evenly browned. Remove from the pan and set aside. To make the sauce, place the finished peppers along with all the accumulated juices onto a large plate or platter and roughly chop them up, not too finely, and set aside. 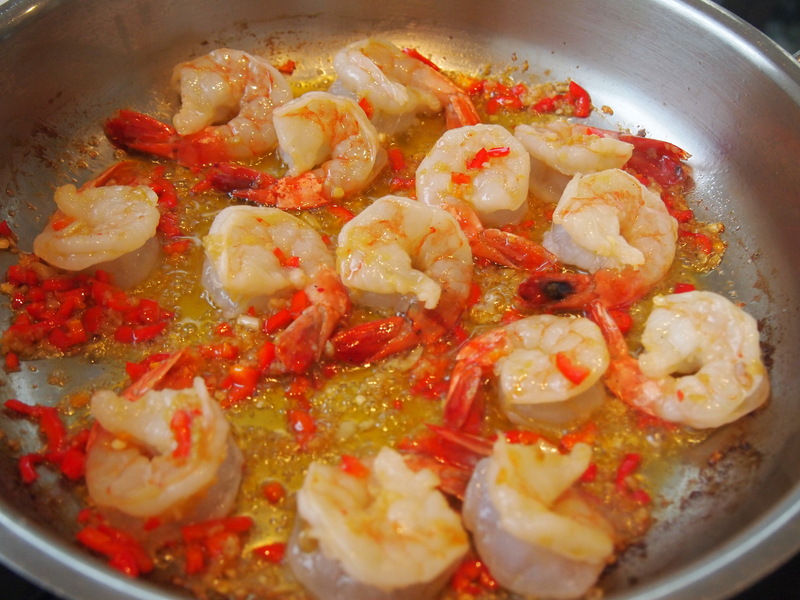 Heat a large fry pan over low-medium heat and add a generous amount of olive oil. Add the garlic and chilli and cook gently for about 4 minutes or until the garlic and chillies become soft and the oil is nicely aromatic. Make sure that your heat is gentle enough for the garlic not to burn. Add the prawns and season with some salt. Raise the heat a little and cook until the prawns have just changed colour. 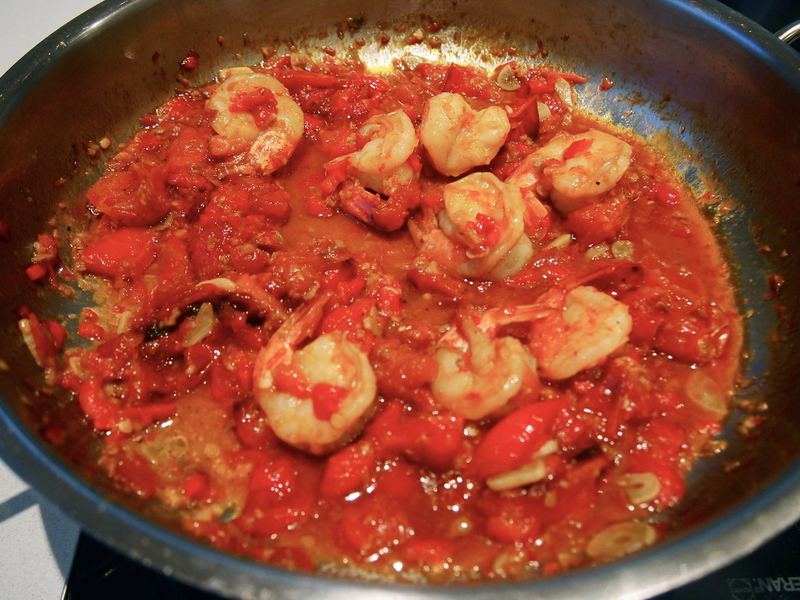 Add the reserved chopped peppers and stir to incorporate them with the prawns, garlic and chilli. 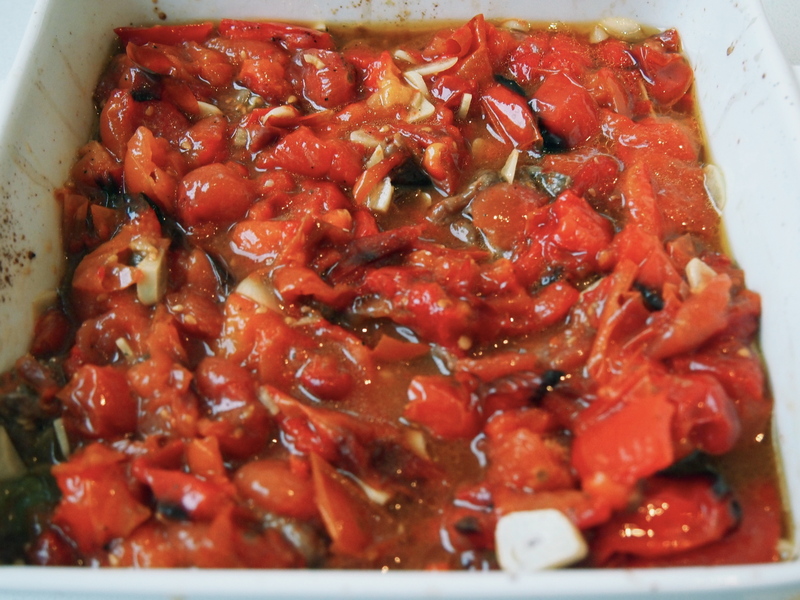 If it looks a bit dry add a splash of water but there should be enough liquid from the peppers, this isn’t a dish with a lot of sauce – there will be just enough sauce to coat the pasta. Bring the pan to a simmer then lower the heat to the lowest setting and cover with a lid. Whilst the sauce is cooking bring a large pan of salted water to the boil. Add the spaghetti and cook until slightly underdone – about a minute or two less than the time stated on the packet. Drain the pasta, reserving a little of the cooking water and add the spaghetti to the sauce. Using tongs, stir the pasta through the sauce, adding a little of the pasta cooking water and good a drizzle of olive oil. To serve place some spaghetti on each plate and from a height sprinkle generously with the pangrattato, the remaining pangrattao can be served tableside.